Hatters boss Nathan Jones believes his side’s FA Cup first round clash against League One Portsmouth at Kenilworth Road on Saturday is the pick of the competition’s fixtures. 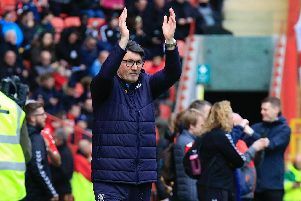 Luton come up against the side who claimed the League Two title last season, although are yet to set their new surroundings alight, sitting in 14th with six wins and eight defeats from 16 games. It hasn’t quite got the romance, but in terms of a football match, I think it’s as big as it comes. Pompey have changed manager since their promotion too, with former Watford boss Kenny Jackett replacing Paul Cook who left for Wigan, as Jones said: “We’re looking forward to it and I think it’s the tie of the round. “Obviously I’m slightly biased, but I really think it’s the tie of the round. “It hasn’t quite got the romance, but in terms of a football match, I think it’s as big as it comes. “This is a real, real good test as they won the league last year and probably did it deservedly so as over the season, the league doesn’t lie. Luton can welcome back Alan Sheehan for the game, as Johnny Mullins misses out due to an ankle injury with Glen Rea banned. The boss continued: “It’s quite a timely return for Alan because Johnny Mullins got injured and Glen’s suspended. “We want that competition and it was an opportunity for Johnny but it’s a bit sad that he rolled his ankle. Jones knows it will be a blow without Rea who has really stepped to the fore in recent weeks, as he said: “Glen’s maturing nicely which is what we like to think we help them with here. “He’s that type of player, he wanted to play Tuesday night, he helped the younger ones and he’s a young one himself. The game could be another chance for midfielder Andrew Shinnie to force his way back into Town’s league side after his match-winning brace against AFC Wimbledon in the Checkatrade Trophy on Tuesday night. Jones added: “He probably would have wanted to do it (return) slightly earlier, but he’s missed a bit of football. “He’s one that we love here, he started in excellent form early on in the season, picked up a little injury and that set him back a little bit. “Because we were doing so well that kind of slowed him getting back to the first team, but he’s back in full fitness now.